U.N. High Commissioner for Human Rights Navi Pillay condemned a series of inflammatory statements by the governor of Sudan’s South Kordofan state, Ahmed Haroun. His speech, which was caught on camera and published by Al Jazeera, calls for Sudanese troops to take no prisoners in the fight against the Sudan People’s Liberation Movement-North, or SPLM-N, rebels in South Kordofan. Haroun tells the soldiers, "Don’t bring them [the rebels] back, eat them alive." She continued by saying that despite the lack of access for human rights observers to South Kordofan and Blue Nile, there is significant evidence of crimes against humanity and war crimes taking place in the two Sudanese states. An August 2011 U.N. OHCHR report documented “extrajudicial killings, arbitrary arrests and illegal detention, enforced disappearances, attacks against civilians, looting of civilian homes and destruction of property,” as well as massive displacement. 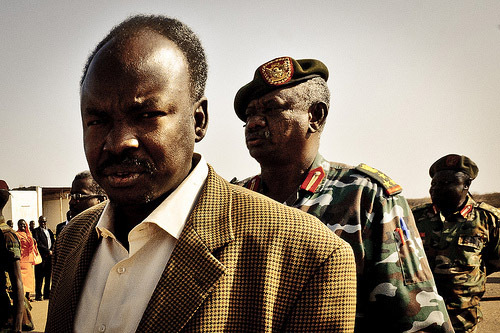 Despite this international outcry the Sudanese government has attempted to downplay and distort the significance of Haroun’s bellicose comments. The ruling National Congress Party, or NCP, dispatched their media officer Rabie Abdel-Aati to do damage control. He falsely claimed that Haroun’s comments were misinterpreted because "[h]e is not ordering the soldiers to kill civilians but to kill rebels; this is war." "The video footage proves what we have been saying all along: that the military and security strategy of the government of Sudan has always been consistent with Governor Haroun's words. For any native Arabic speaker, the governor was giving clear instructions to his troops to bring no prisoners and to wipe the area clean of any insurgency. He was not mincing his words, and there was no room for any misunderstanding or any other interpretation."